Studies show that there are many benefits to putting on your dancing shoes. Not only is dancing a great way to burn calories, it helps with breathing, agility and improving memory. Dr. Sharad Paul, author of THE GENETICS OF HEALTH, shares how dancing can ease diseases like Parkinson’s. The tango is a tempestuous dance. It has many guises, the Argentinians say—the mask of intimacy as dancers hold each other close, the mask of secrecy as the upper bodies are still, and the mask of wild abandon as the legs entwine again and again in a passionate duel. But more importantly, if you do it in true Argentinian style, unlike most ballroom dances, it typically does not have predetermined movements. You go where your partner or the music takes you, effectively making your improvisations reflect your feelings or the music. This was actually why people with Parkinson’s disease did well in Hackney’s study—or, indeed, why the traditional dances of Ikaria and Okinawa are so helpful. People performing the waltz or foxtrot rely on memory of specific foot movement, whereas tango relies on working closely with a partner in the moment. 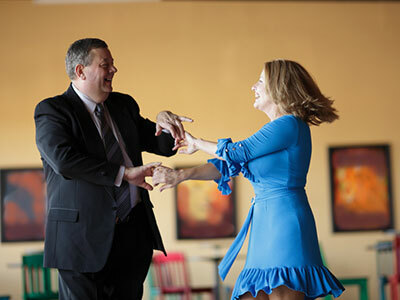 Thus, exercises with predetermined positions like yoga or Tai Chi and foot movements such as the foxtrot could still be beneficial for breathing, cardiac fitness, and agility, but specifically partnered dances like the tango or Celtic dances, where leg movements are predominant, had the greatest benefit when it comes to reducing dementia or improving movement disorders such as Parkinson’s disease. As I said to the audience when I was at the Dalkey Book Festival in Dublin—we can even forgive the Irish for Riverdance! Dancing and its benefits can even start before birth. In 2015, scientists at Institut Marquès in Barcelona studied the effects of music on fetuses of between fourteen and thirty-nine weeks. They used an intra-vaginal music system (which they called a “babypod”) and filmed the ultrasound scans of babies “listening” to music.33 We know that at around sixteen weeks of pregnancy, babies develop their hearing abilities, but astonishingly, these babies began to open their mouths and also move their legs to the music—these dancing fetuses were recorded on ultrasound scans that show these unborn babies responding to the music. Dr. Marisa López-Teijón, who led the study, was quoted as saying that the findings show a fetus responds to music by moving its mouth and tongue “as if they were trying to speak or sing.” The fetal origin hypothesis suggests this fetal dance may help brain development later. After all, fetal life is a hotbed of neuroplasticity—the baby’s brain triples in weight during the last trimester of pregnancy and the surface area of the cerebellum, the part of the brain that coordinates movements during activities like dancing, increases thirtyfold. 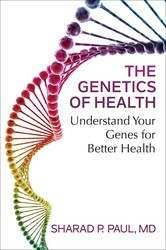 Take charge of your health by understanding the connection between our evolutionary past and our future wellbeing with this practical guide to personalized health and nutrition—from distinguished physician Dr. Sharad Paul. Recognized as one of the best in his field, surgeon, academic, and philanthropist, Dr. Sharad Paul combines everyday health with evolutionary biology and explains how to improve your overall wellness by following a diet and exercise plan according to your gene type. Dr. Sharad P. Paul, MD is a skin cancer surgeon, family physician, academic, skincare expert, evolutionary biologist, storyteller, and social entrepreneur, as well as an adjunct professor at Aukland University of Technology. Born in England, with a childhood in India, he is a global citizen who lives Down Under. In 2003, he received a Health Innovation Award and in 2008, was featured in international editions of Time. He has been called a Renaissance Man by New Zealand Herald’s Canvas magazine and a polymath by Good magazine. In 2012, he was awarded the New Zealand Medical Association’s highest honor, the Chair’s Award. He has spoken at ideas conferences like THiNK alongside Robert De Niro, Tina Brown, David Barash, and V.S. Naipaul. He recently won the acclaimed Ko Awatea International Excellence in Health Improvement Award for Leading Health Improvement on a Global Scale.